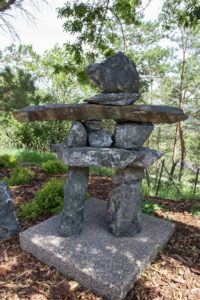 Inukshuk was created in memory of heroic 14-year-old David Kootook, who was aboard a medical “mercy flight” to Edmonton in November, 1972 when a blizzard brought it down in the Northwest Territories. Kootook and pilot Martin Hartwell survived; two others were killed. Despite suffering from appendicitis, Kootook used his traditional skills to keep the injured pilot alive for 23 days before perishing himself. Hartwell was rescued eight days later.